Concrete can be used for a variety of applications when it is important to have a strong, weather-resistant material. You can build animal feed troughs from concrete relatively easily by constructing a simple plywood form. Once the concrete has set, you can remove the form and the feed trough will be ready to use. 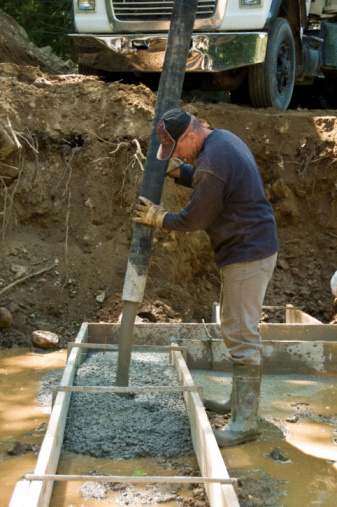 It is best to pour the concrete where you intend for the feed trough to be located. This keeps you from having to move the feed trough later after the concrete has set. 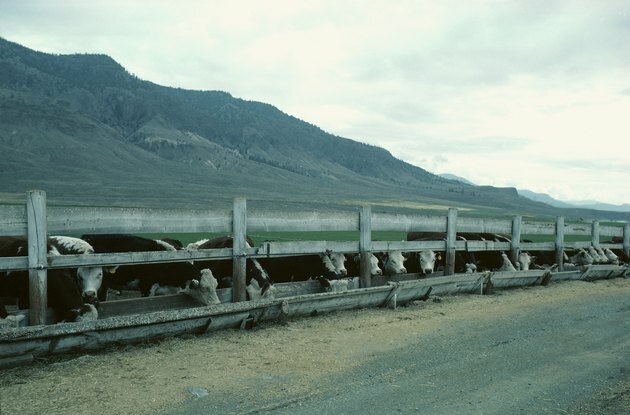 Simple concrete feed troughs can be constructed quickly. Cut the plywood forms for the feed trough with the circular saw. You will need two sets of four plywood boards for them, regardless of what size feed trough you are creating. The first, larger form will hold the outside edge of the concrete until it has set. It needs to be the overall outside length, width and height that you want the feed trough to be. The second, smaller form will hold the inside edge of the concrete and should be sized according to the volume you want the feed trough to contain. Cut the 2-by-4 support beams for the feed trough forms. The 2-by-4s that you use to support the outside form should wrap horizontally around the outside of the form, connected to one another with wood screws. The 2-by-4s that you use to support the inner form should be attached to the inside of the form, and can be cut to the height of the inside form so that you can mount them in the inside corners of the form. If you need additional bracing for the inside form due to the height of the walls of your feed trough, simply cut 2-by-4s to the needed length and prop them inside. They will not need to be secured. Build the two forms you will need to pour the concrete feed trough. Place the larger form where you want the feed trough to be located. It's a good idea to place the form on flat, solid ground, where it won't begin to sink over time due to its weight. Mix the concrete with water until it has reached the consistency of peanut butter. Use a garden hoe to mix the ingredients together, and then use a shovel to dump the concrete into the bottom of the concrete feed trough form. The depth of the base of the trough should be at least six inches. While you are doing this, place steel rebar in the concrete, being careful to bury it completely in the concrete. Rebar should be positioned approximately every eight inches within the concrete. Smooth the top of the concrete with a mason's trowel until all of the stones have settled below the surface of the concrete, leaving behind a smooth, glossy surface. Place the smaller form inside the larger so that the forms are evenly spaced to create equal sized walls around the entire perimeter of the trough. Drive rebar into the base of the concrete within the walls, but do not allow any rebar to touch the wood forms. If necessary, use a metal saw to cut the rebar to the necessary length. Allow some pieces to overlap and some to remain horizontal. Fill the wall with six inches of concrete all the way around the trough, and then place additional rebar horizontally on top of this layer of concrete. Fill the wall with approximately six more inches, then add more rebar. Add more concrete until you have filled the form with concrete all the way to the top. Smooth out the top of the trough walls with a mason's trowel. Remove the forms after the concrete has been allowed to set for at least three days. If at any time during the curing period, there is heavy rain in your area, cover the trough with plastic to prevent its becoming saturated, which would compromise the strength of the concrete.